NEW HAVEN -- Call it a Divine Intervention. On the eve of the biggest game of his hockey career, Fairfield's Kevin Robinson had a premenision he might have a good game in the CIAC DII state hockey championship against East Catholic. Little did he know, his dream would soon become a reality. With the game tied at three in overtime, Robinson scored on a penalty shot with five minutes and 31 seconds left to give the Mustangs the 4-3 victory and the programs first state title Wednesday night at Ingalls Rink. "To be honest with you, I had a dream about it last night where I scored three (goals)," Robinson said, "It's an unreal feeling." Robinson was the offensive hero of the night as he scored all four of Fairfield's goals. "I'm happy, I want to cry tears of joy," Robinson said. As amazing as the finish was, it was just the capper to an exciting night. Wirth seconds remaining in the third period, tied at 3, Fairfield's Thomas Kryspin plucked in a deflection into the net as time expired for what the Mustangs thought was the game-winner. Gloves went flying, and a mass celebration ensued. But the referrers reviewed the play and waved off the goal, saying it did not beat the clock. "We walked off the ice with new life," East Catholic head coach Drew Clarkin said. "It's whoever scores that first goal ... gets the right bounce at the right time, it's equal opportunity at that point. It could be us, it could be them. Unfortunately it didn't work out in our favor." The No. 13 seeded Mustangs never doubted themselves as this entire postseason run as been about proving themselves. Wednesday's showdown with No. 2 East Catholic was no different. 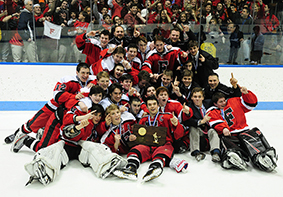 "The best way to sum it up is we had goals and we hit all of them," Fairfield head coach Mark Pettorini said. Both squads were highlighted by a strong defensive effort all night from the line and goalies. "That line has been awesome all week long in practice," Pettorini said. East Catholic's Thomas Usseglio finished the game with 26 saves, including a point-blank stop as a determined Charlie Meader came at him in the third period. He's been absolutely stellar for us all season," Clarkin said of Usseglio. "I thought he made some tremendous saves. He's really been a super star for us all year long." Fairfield's Kyle Greenhurst was just as big, coming up with 17 saves and keeping the Mustangs in the game as the Eagles held a 3-2 lead heading into the third. After Robinson scored two early goals off assists from teammate Conor Scharlop, to jump out to an early 2-0 lead at the 11:01 mark, East Catholic's Alex Manner cut the lead in half. East Catholic (18-6-0) had the momentum in the second, getting two goals - from Brian O'Connell and Griffin Casey, but Fairfield rallied in the third, setting up the epic finish. "First period we came out we had a great first period, second period they kind of took it too us a little. Pretty much the motivation was this was it," Pettorini said. "It was real emotional." Fairfield finished the season at 14-10-0. Penalty shots - [OT 09:42] FFLD Robinson, Kevin GOOD.